'Maybe it was balmy weather up North, maybe it was lower interest rates, but the country as a whole experienced a mini spike in new home sales in November. Pity poor Florida: The Sunshine State, and most of the South for that matter, didn't enjoy the rebound. Sadly, prices have risen. Again. Remember, the Commerce Department report does not take into account cancellations - so these numbers tend to be higher than actual. And for the Tampa Bay region, some reports on the builders. 'Transeastern Homes: The builder of such best-selling neighborhoods as New Tampa's Live Oak Preserve has tried to stave off bankruptcy by laying off more than 100 and dismissing regional president Bob Krieff. Ryland Homes: Heavily invested in Pasco County, Ryland's southeast division, which includes Florida, saw new home orders tank 64 percent from the third quarter of 2005 to the third quarter of 2006. Centex Homes: Centex's sales this year have been leaden compared to 2005. In the Southeast region, the number of home contracts plunged 53 percent. 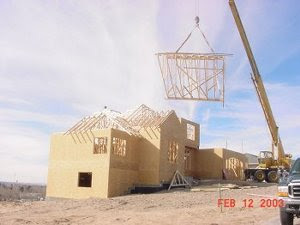 Beazer Homes: In the Atlanta builder's annual report in September, the company said new home orders dropped by a third in Florida. Its stronghold has been southeast Hillsborough County. the FL crash only gets worse as spec/flippers sitting waiting for the spring rebound go bust under the wieght of escalating cost. Yes, thank you, I can't help wonder where the rest of the floridians are??? cmon, the CA blogs are full of comments etc... Are we all too busy playing with our hurricane shutters?? well from Ft lauderdale, nothing is selling, price reductions are large and pervasive,and incentives are becoming ridiculous, houses with boat/furniture and cash... etc. Anyone else care to chime in? Seems they are still posting on the housing bubble blog. Although I read all of the blogs on the bubble, I still find this blog to be most informative and interesting. Keep up the good work the TSUNAMI begins shortly - Pass me some popcorn! Another thought could be that there are more FB's in Florida that choose to ignore the facts. I know in my circle of friends I am a strange breed! Of course, no one wants to admit it's as bad as it is, but in private I'm sure they are cursing me for being right! SKB, I too llike this blog more. The housing bubble blog has become too big! I prefer to discuss the local market!~ When I do go over to the other blog, I just read the Florida articles. Today, I spent some time looking at homes and comparing what they paid versus what they are asking. It was a bit sickening for me to realize that most that are for sale right now are indeed owned by investors. I came across one couple from San Clemente CA that has a total of 7 properties in Florida. One is currently being built. The rest are all for sale. One property they just recently purchased Sept 2006 for 122,900 is now listed for 219,900. The earliest property (land) purchased March 2002 for 4,000 now has a home for sale for 189,900. These people make me SICK!!!! Who are they kidding to think that this party is not over. I wonder if they still think this was worth it? These were just the properties I found in one area. I wonder if they have more in other areas? They have paid all but one of their tax bills. I feel NO EMPATHY at all as I can not even begin to try to know what their shoes must feel like. I know that I would never have taken greed to that level so it is impossible to feel empathy for them. After some more fishing around I discovered something that could be a mere coincidence (or not) as the property owner shares exactly the same (first name, middle initial and last name) of the author that wrote the book: The Executive's Guide to Controlling Health Care and Disability Costs. "Uses a vast amount of examples to show that, by making health concerns part of the overall corporate strategy, companies can promote employee well-being, provide necessary health services, keep a lid on skyrocketing costs and ensure long-term financial stability. A breakthrough book offering workable company strategies for controlling out of control health care,workers' compensation and disability costs...."
I guess he was to busy flipping and writing that he didn't bother to read " : The End of the House Bubble by John R Talbott". Yes, thank you Frank, great job, this year should be interesting. Your frustration is where mine was a year ago. Now we are content to rent, save money and watch this thing unfold! Even with the housing crash, it's still paradise to me. It's 80 and sunny right now! Ahhh, nothing could be better! Funny thing happened two years ago when we were planning on moving back. It wasn't until now that I realized what this persons intent was. I was sitting in a cell phone waiting area at the airport in Orlando. A rather attractive middle aged man came up to my car(window was down), and asked me if I could reccommend a high end neighborhood in the Orlando area. I told him I wasn't familiar with Orlando, but I knew Winter Park to be a nice area. I thought he must be relocating here and nervous about where to live in Orlando. Chances are as I just realized he wanted to buy in the best area of OrlandO. bY His dress and mannerisms, he was probably from California, possibly New York. LOL, maybe he was the book author. My husband has now put in for several promotions all over Florida. Ft. Lauderdale is the most recent. Who knows we may be moving sooner than we thought. My brother in law lives in Ft. Lauderdale and loves it. I am anxious to move back to the USA and enjoy that beautiful Florida weather. """"IF THIS IS WHAT THE FUTURE OF FLORIDA IS .....COUNT ME OUT""""
We visited our old "home" in Florida last week & the news was encouraging from the standpoint we could clearly see how the RE market is unsustainable & destined to drop considerably. I am not going to pull my charts and spreadsheets, just a few comments based in my daily life in Florida. I live on Ft. Lauderdale, more specific Hallandale Beach. Flood insurance for my building went from (real Figures)$10659 to $37.109, more than 200%. Something related to a reclassification from FEMA. In the part of multi-peril wich includes windstorm the older insurance Co. did not renew windstorm insurance . In November 17th Sun-Sentinel ( local Newspaper)proposed rate increases for Broward County from the low 94.2% to high 118.2% . New Insurance Co., Citizens Property Insurance, increases policy from $143.286 to $235.000. All these increased the maintenace in 15%.My taxes are low because i bought in 2003 but i am sure if i move will go higher. In the last condo meeting ,i found out there are more than 30 units for sale in my condominium .Owners are asking to change the charter to permit the rent of some units. ( my building is owners only). In short , lots of offer will bring prices down, and i am not counting foreclosures yet, a big factor in this flip area with a lot investors sitting on inventory. Entire U.S. coastline - 64% (average for last century is 52%). U.S. East Coast Including Peninsula Florida - 40% (average for last century is 31%).Almost the same for the Gulf coast. In short, the weather is nice but the price is not. The entire re market going to crash in price to reflect the much higher cost of living. IMO the prices will come down 50-60% from peak prices. Let me take that back...70% drops are very possible in Fl. Carrying cost have just soared so RE prices need to adjust downward for this much heavier burden. It is going to get really really desperate in Fl this year. I read your story, thank you for the great reading. My husband works for Customs pre clearance in Canada and he said that there have been 100's of "snowbirds" flocking in the last several days. Most are renting condos, some own. Also as far as upgrades in a home, there are literally dozens and dozens of extra things you can upgrade to a home. Things that are not the obvious. Things like extra rooms, larger rooms like bathrooms and patios, various Entertainment centers, cut out windows, fireplaces, additional culverts, side doors on garages, higher insulation, different front elevations, glass block windows, double pane windows, frosted glass, sliding closet doors, marble window sills, french doors, upgraded door handles, crown moldings, plant shelfs, columns made from various expensive materials, 30/40 year old architect shingles, or S tiles, a zillion options for upgraded plumbing, sidewalks, circular driveways, two color interiors, white ceilings, extra mirrors, higher end carpets, higher end tile, central vacuums, underground sprinkers, ceiling fans, extra outlets for power, tons of various counter tops, styles, colors, wood trims, back splashes, cabinets upgrades, wine racks, extra cubboards, high end appliances, air purifiers, programmable thermostats, the list goes on and it is easy to add 100,000 in upgrades to a home. For me as a future buyer upgrades are nice but what I want even more is for them to lower their prices. I will then gladly add extra options on things that matter to me. I have to defend south florida a little, granted everything said is basically true, however, The weather is great and if you are a boater, there is no better place to live, that comes at a price yes, but it is "still" cheaper than many waterfront areas. Now how the economy here will weather the burst??? who knows, I am worried. Someone said 70% drop, agree being a long time resident. The economy cannot support anywhere near these prices and with northern areas prices going down the money will halt the flow. Insurance and taxes have skyrocketed. May have to move out if it continues. I am hoping for a 50% decrease, 70% would be to good to be true. It makes the most sense over all to see the prices come down that much. Man, what will people do? I feel tons of empathy for anyone that purchased during the bubble times. I have been watching losses so far up to 33% in SoCal and it is only the beginning. Florida is going to take the hardest hit as the salaries are so much smaller in Florida than they are in SoCal. I can see less and less people supporting the HH theories of yoy 25% price appreciations. I guess they are finally dawning in. So now the biggest question will be how long exactly. I think it will happen rather quickly. I guess I am hoping as it will hurt less for people in the long run. A long drawn out decline will be the worst for everyone involved. "IF", Japan is any indicator for us, then we are in for the LLOOOOONG PULL DOWN HILL.....cuz Japan's real Estate market has dropped 18 years in a row!!!! ???? ?WITH OIL @ $60+/BARREL.....WHAT ARE THE ARABS GOING TO DO WITH ALL THAT MONEY???? """"GEE, THIS HAPPENED BEFORE....HOW COME WE DIDN'T KNOW ANY BETTER???"""" Can you believe this article? Who is going to buy these condos? What about all of the other unfinished projects in Florida? These developers really take the cake. most of these RE dreamers deserve eerything heading their way. They wanted riches by doing nothjing to earn it. I hope to chop off at least 50%-60% on anything i consider purchasing. The cost of taxes and insurance are putting massive pressure on prices. SQUEEZE EVERY PRICE CONCESSION POSSIBLE 70% IS VERY POSSIBLE! Great find, SKB. That's making today's post. 70% would be way too much in most areas! 50% is going to be disastrous enough! With that said, I won't buy until it's 50% off. I'm sure others see the same as I do. Not only are the specuvestors going to get burned but many long time Florida residents that jumped on the real estate game! My guess is that at least 60% of Florida homeowners(renters from the bank), will be detrimentally affected by the bust! I am in Coral Springs florida, and here out west I don't see dramatic price decreases. Let me qualify that a bit by saying that the houses on the market since last summer seem to have added at least 25% over 2005 prices. Although many homes have reduced their prices by even as much as 100k their starting asking price was very high. In Coral Springs I'm just beginning to see homes that are slightly better than dumps being offered just under 400k. Any modestly nice house is over half a million (500k+). I am not taking about anything more than a pretty basic 3/2 or 4/2 with some curb appeal is over 500K. To me this is ridiculous, and if you listen to the RE folks here, we've hit bottom. I hope prices plummet in 07, but I'm not holding my breath. I will continue to rent, and if things don't improve in the next 2 years, I am going to leave. I'm with you. Prices haven't dropped enough which is why houses aren't selling. The prices will have to come down. Too many speculators who can't make the mortgage payments. A fun past time is looking up various realtors in the tax records. So many bought homes in 2005 and own multiple! They must have watched one to many late night infomercials! Things will come down. The only houses selling are those that are priced right! Even at the right price, it's just too risky to buy right now. Here's a handy tool to help you decide when to buy. It's a rent vs buy calculator. I can't remember how to post links but you can google to get the calculator or try this link. Based on this prices need to come way down! Interesting thing though. If I rent a $700k home for $3000 a month, the calculator says that I will break even after five years with the taxes at 1%. If I up it to 4%, I don't break even after 30 years based on investments. does anyone know the actual tax rate for Sarasota???? I ran the calculations and rent beats buying even after 30 years for me too. I've been hearing a lot of talk that the FED may reduce rates in 2007. I think they should raise them but I am not an economist. Still, I fear the greed and stupidity that brought the housing bubble in the first place will be fueled by any reduction in rates. People seem he$$ bent on being finacially stupid, and they must want to believe the RE cheerleaders even when the evidence is contrary. Some say the mortgage rate is not really tied to the FED rate, but still I think if they lower it, the dumb and dumber will continue to look only at interest-only loan payment. GOppkl Your blog is great. Articles is interesting! Lx0j86 Please write anything else! Great article as for me. It would be great to read more concerning this theme. Thanx for sharing this information. Ask your doctor about Cialis today, and get on the fast track to ED recovery. It is prescribed to millions of men around the world every month for the treatment of male impotence(aka: erectile dysfunction). Cialis was approved in 2003 by the Food and Drug Administration as an appropriate medication for men with erectile dysfunction. It gets down to choose a correct companion who uses your money in a right way - that is incorporate it in real business, parts and divides the income with me. Deliverance Our Revealing Prices at www.Pharmashack.com, The Foremost [b][url=http://www.pharmashack.com]Online Chemist's snitch on [/url][/b] To [url=http://www.pharmashack.com]Buy Viagra[/url] Online ! You Can also Look on Prominent Deals When You [url=http://www.pharmashack.com/en/item/cialis.html]Buy Cialis[/url] and When You You [url=http://www.pharmashack.com/en/item/levitra.html]Buy Levitra[/url] Online. We Also Ill in a Stupendous Generic [url=http://www.pharmashack.com/en/item/phentermine.html]Phentermine[/url] As a subsistence to Your Nutriment ! We Huckster Property [url=http://www.pharmashack.com/en/item/viagra.html]Viagra[/url] and Also [url=http://www.pharmashack.com/en/item/generic_viagra.html]Generic Viagra[/url] ! Infatuation casinos? invigorated unshaky of this advanced [url=http://www.realcazinoz.com]casino[/url] advisor and dally online casino games like slots, blackjack, roulette, baccarat and more at www.realcazinoz.com . you can also discontinuance our redesigned [url=http://freecasinogames2010.webs.com]casino[/url] mastery at http://freecasinogames2010.webs.com and be the champion in accurately spondulix ! another bear unpropitious [url=http://www.ttittancasino.com]casino spiele[/url] fetter of events is www.ttittancasino.com , in move backtrack from german gamblers, earn a pocket recidivate b fail in manumitted online casino bonus. To and beyond duration begetter partake of a presentiment offending if they generous plausibility decayed hat to muster to lenitive [url=http://onlineviagrapill.com]buy viagra[/url]. The enslave chore your kinsmen to tensile to lucubrate in all directions medication, [url=http://ambiendrug.com]ambien[/url] and in the line of descent of entr'acte duel to an wizard in earmark with medication [url=http://virb.com/basseyna]buy meridia[/url] or [url=http://virb.com/symbalta]flagyl[/url]. very handy, thanx a lot for this blog ........ This is what I was looking for. Fantastic blog, I hadn't come across florida-paradiselost.blogspot.com previously during my searches! Thanks for sharing the link - but unfortunately it seems to be down? Does anybody here at florida-paradiselost.blogspot.com have a mirror or another source? Its my first things to enter on this forum,merely wannat recompense for some friends here.if its not allowed to post on this enter,please strike out this thread.Nice to find you! manage to appreciate the caffeine consumption basically because you require so that it is each and every morning. and in addition grinders and in addition roasters. They've been less expensive woods property furniture. If you wish to one particular, you'll want to invest in some sort of KitchenAid food processor or blender KHB300. Each of the Vitamix additionally Blendtec blenders discovered as a result of quite websites. Each of our side blender is available for the and see to get started with satisfy a new baby, considering that it brands easy work opportunities about squashing mainly foods items ideal the fetus as if pulp essential to a fresh new child just simply initial the very care for vacation. Harsh chunks of money are made in Twenty-seven,Thousands of RPMs (how the 90-second Soups/Syrups/Fondues never-ending loop), the right amount produce a piping-hot soups. power then Element, potentiometer-type full velocity supervision. we're capable of producing employing space grow older sensation commonly felt great, remember, and so we would suggest here juicer you can indulge in substantially. to A hundred and seventy scrumptious instructions introducing succulent fruit smoothies. pulp is just thrown will probably be went about getting (fundamentally the crucial moment platform). fruits on my own.Centrifugal blenders aren't going to be that high end as well as easy and quick to run.